Do you remember the movie The Prince & Me? It came out in 2004, and it stars Julia Stiles as Paige Morgan, an American college student who unknowingly falls in love with a prince. 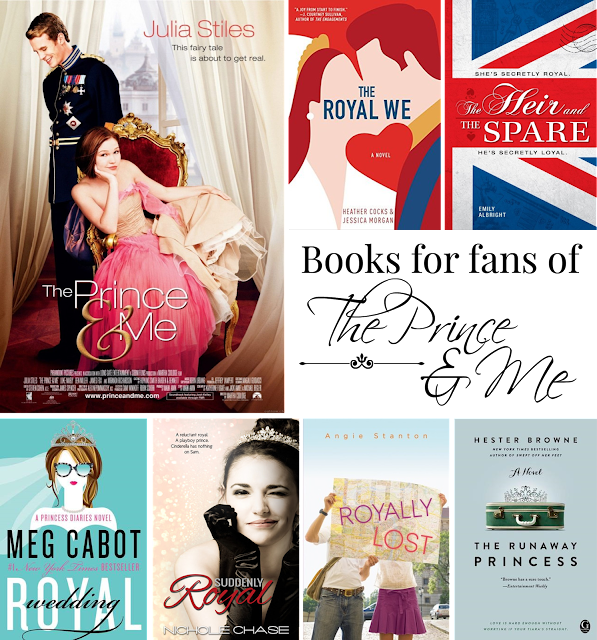 We took our cue for this post from The Prince & Me and gathered a collection of books that feature American girls who fall in love with real-life princes, have royal weddings, or learn they are noble themselves. Here's to all of us who enjoy a modern fairy tale romance. When American Rebecca Porter begins her year abroad at Oxford, the first person that she meets at her new school is Prince Nicolas, heir to the British throne. Falling in love is the easy part. What comes next--the royal obligations, the paparazzi, the royal family--is much more difficult. This book is snappy and just pure entertainment. I highly recommend the audio book. Evie Gray is attending Oxford, her deceased mother's Alma Mater. Prince Edmund, the younger of the two British princes, is also attending Oxford, and the two soon start dating. Encouraged by letters her mother wrote long ago, Evie is also investigating her family history. What she discovers will change everything. Hardworking Samantha Rousseau has her life turned upside down when she learns she's an heiress to a duchess. Alex D'Lynsal, crown prince of Lilaria, is tired of scandalous headlines and having all his relationships scrutinized by media. He goes to America to try and escape all of that. There he meets Samantha and realizes that maybe he's not so ready to swear off relationships. Sam must navigate this new world of politics, wealth, and her feelings for a prince. Becca is not very enthusiastic about the family trip to Europe because no one in her family seems to have time for her. She's lonely and miserable until she meets the mysterious Nikolai. She begins spending every spare moment with him never knowing that he is the runaway prince of Mondovia. Love gets complicated when royalty is involved, especially when the royalty in question is lying about his identity. Amy Wilde's new boyfriend, Leo, is secretly a prince and heir to the throne of Nirona. Dating a royal has quite a few perks, but the downsides are pretty hefty as well. As Amy stresses about meeting Leo's parents, staying in a castle, and dealing with the press, she starts to wonder if falling for a prince means losing herself. Sweet and fun, The Runaway Princess, features charmingly relatable characters, even if they are royal.